In partnership with Liquidmetal Technologies from the US, Engel Austria has developed a new Liquidmetal technology that allows metal alloys to be efficiently injection molded. The zirconium alloys feature an amorphous, i.e. non-crystalline, structure, which is why they are referred to as metallic glasses. Components made from these materials are hard, but at the same time elastic. For instance, the elasticity of steel is 0.2% and for titanium it is 1%, while the value for components made of Liquidmetal alloys is 2%. In addition, the materials have low specific weight with superior corrosion resistance, making them an adequate option for precision components which are subjected to high mechanical stresses. 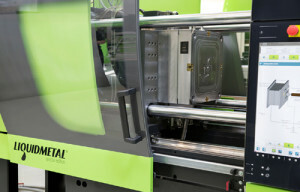 A new injection molding machine based on the Engel e-motion series is being developed for processing of Liquidmetal. Compared with conventional machines, the major difference lies in the injection unit. The Liquidmetal alloys are available in the form of slugs cut from round rods. These blanks are automatically fed into a melting chamber where the material is melted inductively under high vacuum conditions. Instead of a screw, the machine has a piston with which the molten metal alloy is injected into a thermo-regulated mold. Rapid cooling under exclusion of oxygen leads to the forming of the amorphous structure. Standard robots, for example from the Engel viper series, are used to remove the finished parts. The sprue can for example be removed with the help of a water-jet cutting machine or mechanical shears. By providing parts with high surface quality in a single step and in short cycles, Engel said Liquidmetal is a better alternative to metal injection molding (MIM) and CNC processing. Another advantage is that there is no waste accumulated in Liquidmetal processing because the sprues can be recycled. In addition to electronics, aerospace, military technology and sports equipment, Engel sees particularly good potential for this technology to be used in medical applications. At the Engel Symposium 2015, the company demonstrated production of medical forceps with Liquidmetal alloy. According to Engel, the technology has already found a first area of application in the entertainment electronics and watch industries. The licenses for the new method are obtained from Liquidmetal Technologies. Engel delivers injection molding solutions to licensed partners.